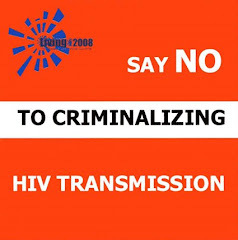 In The Life, the longest running show on broadcast TV documenting the GLBT experience, is featuring the criminalisation of non-disclosure in the United States this month, starting today, World AIDS Day. I was actually interviewed for the show, but was left on the cuttingroom floor due to time constraints. I totally get that they needed US voices, and there are plenty - including my colleagues Sean Strub and Catherine Hanssens of the Positive Justice Project and the leading US academic researcher into the inpact of US disclosure laws, Carol Galletly. (Her most recent findings were reported at aidsmap.com in July) However, you can still see me at the end of the segement giving my presentation at the PJP launch in September. You can watch a preview of the episode below. Visit In The Life's website to see the entire episode. In related news, another interview that I did when in the US in September that finally gets an airing is with POZ magazine. It's six minutes of me talking about the problems with criminalisation in the US, and hopefully I get the message across!